Life is busy. So why waste time boiling noodles, sautéing onions or browning beef? The recipes in this book will still get steaming, delicious home-cooked meals on the table, but with much less up-front work on your part! The no-fuss, no-muss methods help you toss together or layer uncooked ingredients, then pop the meal into the oven to bake – allowing you time to pick up the kids, watch that hour-long soccer game , run the day’s errands or just simply take some time for yourself. 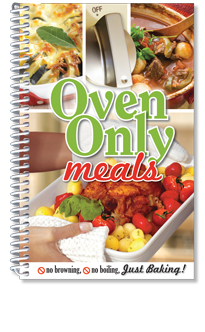 Whether you need your meal to bake for 30 minutes or 3 hours, this book provides the recipes needed to fit your hectic schedule. Try quick-baking dishes like Bruschetta-Stuffed Chicken and Topsy-Turvy Pot Pie. Enjoy hearty casseroles like Fajita Lasagna and Chicken Noodle Hot Dish. Or savor slow-roasted meals like Autumn Harvest Beef or Honey of a Turkey Dinner. Lovin’ from the oven – at its best!